Rich in flavor, loaded with fresh ingredients, and prepared in a multitude of ways, ramen is a treat to your taste buds. Authentic ramen—typically made with wheat noodles and a meat or fish-based broth—is truly decadent. Whether you're craving pork belly or an all-veggie variety, these amazing New Hampshire ramen places have something just for you. Here are our favorites. 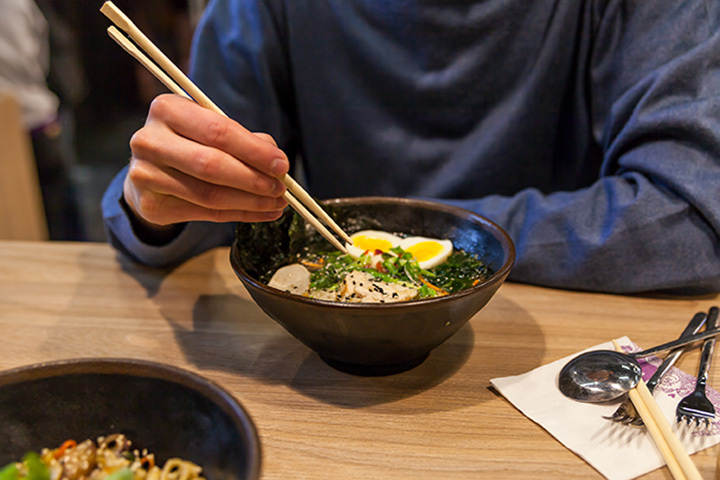 Enjoy delicious ramen at Noodles & Pearls in Concord. The spicy sesame noodles are a local favorite. They even have gluten-free ramen for those with food sensitivities. The ramen at Shio is absolutely divine. It features homemade Japanese ramen noodles with a pork stock base, and is loaded with bean sprouts, scallions, bamboo shoots and pork. A soft-boiled egg tops the bowl off perfectly. Miso and spicy miso serve to further enhance the rich flavor. You’ll become a regular patron once you’ve sampled the ramen here. The Spicy Miso Ramen at Buba Noodle Bar is definitely a fan favorite. Choose from soy glazed chicken or pork belly, and relish the rich flavor of spicy miso, kimchi, bok choy, scallions and a soft-boiled egg. No matter the season, this flavorful bowl of ramen is sure to warm the soul. The pork ramen is to die for at You You Japanese Bistro. The five-spice roasted pork even further enhances the flavor of the delicious broth, ramen noodles and scallions. It’s one of their most popular dishes, and regulars return time and time again for a steaming hot bowl. The option to “Create Your Own Ramen” at Muse Thai Bistro means you get everything you like best, in one hot, delicious bowl of goodness. Choose your broth—chicken, tom yum or spicy kimchi—and then add beef, chicken, pork, veggies, shrimp, duck, seafood or tofu. Does it get any better than that? The Spicy Soul Ramen at Crazy Noodle is a unique twist on classic ramen. This Korean ramen is made with a kimchi broth with pork or beef, and includes bok choy, mushrooms and dried seaweed. The spice is flavorful, not overpowering, making for a delicious, hearty bowl. The Japanese ramen at Sushiya has people coming over the Vermont border into Hanover, New Hampshire to marvel at its delicious flavor and hearty servings. Choose from Kakuni Ramen, Miso Kakuni Ramen or Shoyu Ramen, and relish the flavors of beef bone broth, pork belly, veggies and more. The Yoshimama Ramen is a hearty dish made of miso or soy broth. Choose from a variety of options for protein including both chicken and beef, as well as vegetables, shrimp and more. The plentiful helping is delicious and satisfying. The ramen at Oba Noodle Bar has guests coming back time and time again. Made with miso broth, it features Chashu pork, seaweed, Japanese bamboo, corn, scallion, and—of course—the ever-present and oh, so delectable egg. Spicy but not over the top, the flavors meld together to create a real taste temptation. At Notorious Noodles, ramen is king, and little touches of New Hampshire are even infused in some of the recipes. Their 24-Hour Pork Shoyu Ramen includes maple syrup, as the head chef is a New Hampshire native. Their Tonkotsu Ramen is very popular, too.